Orange Creamsicle's are a classic frozen summer treat. 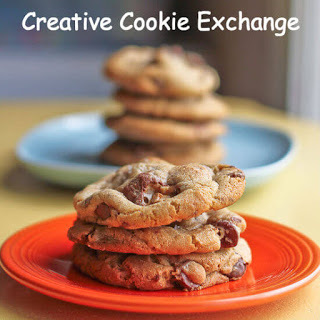 Look what happens when you turn them into a cookie made from meringue for this month's #CreativeCookieExchange. Italian Meringue is made by whipping a boiling sugar syrup into gently whipped egg whites until they are stiff and the meringue cools. It does not require further cooking prior to use and will not deflate. This is the perfect meringue to use as a pie topping or Bombe Alaska. Swiss Meringue is made by whisking egg whites and sugar in a bowl that sits over simmering water, without it touching the water. A thermometer is used to make sure the mixture reachers between 120℉ and 130℉ to ensure that the sugar is completely dissolved. The mixture is then taken off the heat and beaten at a high speed so that it becomes very stiff and cools down. This meringue is very shiny, almost like a marshmallow, and holds it shape well. It can be baked or used as an ingredient in frosting. 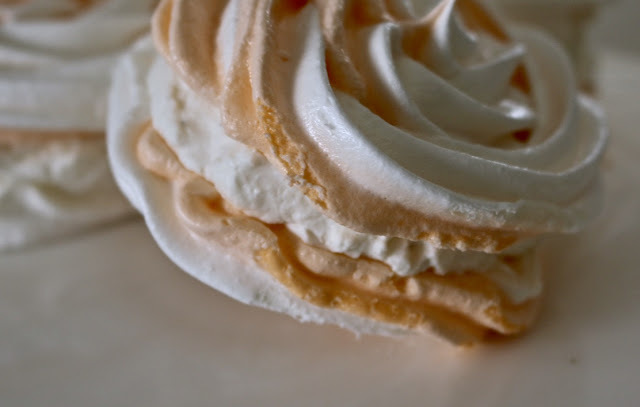 This is the perfect meringue to frost cookies, cakes, and cupcakes once it becomes a Swiss Meringue Buttercream. French Meringue is the easiest meringue to make as it is just egg whites whisked in a bowl until soft peaks appear, and then sugar is very slowly added until it becomes a light and fluffy, with soft peaks. It is customarily piped or spooned into shape. It is generally cooked low and slow, so that you end up with a perfectly crisp meringue. 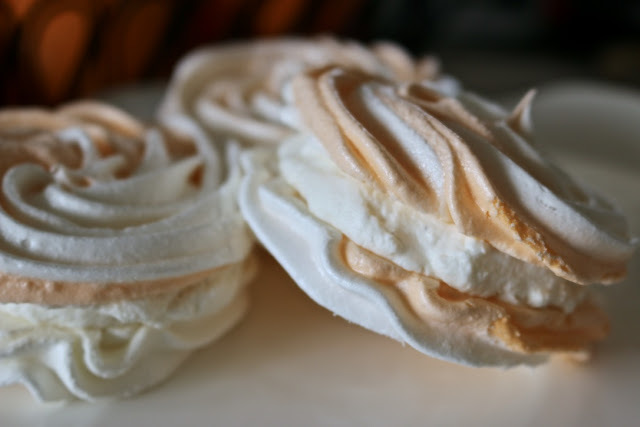 This is the perfect meringue for a pavlova, to make cookies (like I did), or to fold into a batter like a soufflé or a sponge cake. I will let you in on a little secret, I am not the biggest fan of meringue - does that make me un-Australian? I mean, pavlova is like our national dessert. However, it is the theme for this month so I was determined to find a cookie that I would like. Creamsicle's seem like such a fun dessert, and the idea of turning them into a cookie intrigued me. The original recipe called for a Swiss Meringue filling, but considering the secret I just let you in on, that wasn't going to happen. 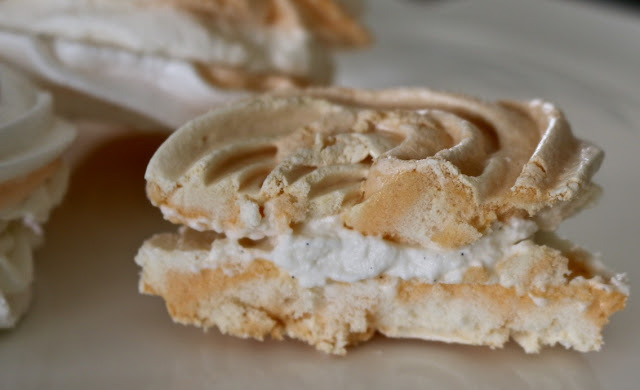 My alternative was to make some vanilla bean whipped cream and use that to sandwich the two cookies together. This made perfect sense to me since the original popsicle was orange on the outside with an ice cream center. Come to think of it, these cookies would also we awesome with vanilla ice cream in the center. One bite of these cookies and you are immediately transported to your childhood, and the simple joy of eating a creamsicle on a hot summer day. The orange gives the cookie a subtle citrus zing and the cream is sweet with vanilla flecks, and together they reminded me the popsicle, but also an Orange Julius. Make sure that you do not fill the cookies until just before eating them, as the cream will cause the meringue to soften and it will not longer have that crisp, crunchy exterior that these cookies need. Also, these are best made on a cooler day as the humidity can play havoc with making meringue. If you are making them in advance ensure that they are placed in an airtight and moisture-free container so that they remain crisp and do not begin to weep, and keep the container in the coolest part of the house - besides the refrigerator of course. If you would like to know more about #CreativeCookieExchange and see what the other bakers made for the Meringue Cookies theme please scroll down below the recipe. 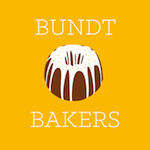 Thanks to Laura from The Spiced Life, who is our host & fearless leader. 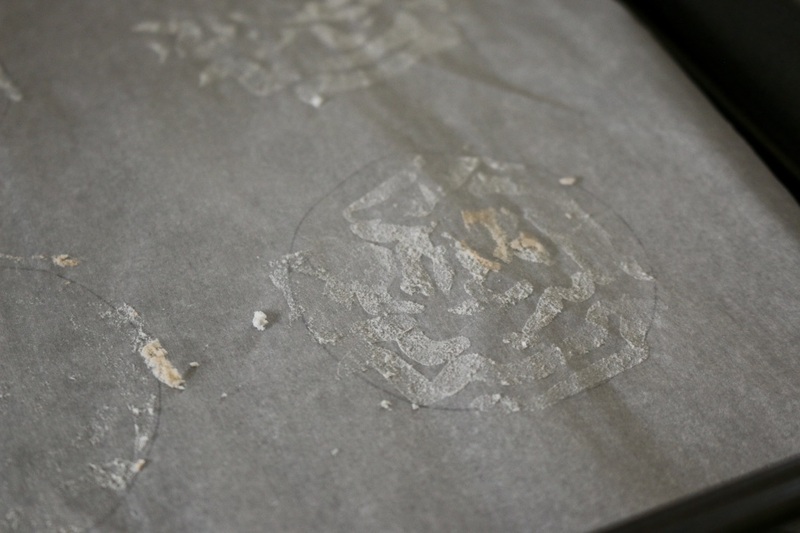 Line two half sheet pans with parchment paper. Transfer the egg whites to the bowl of a stand mixer fitted with the whisk attachment. Whisk on high until just foamy and add the salt, cream of tartar, and vanilla essence. With the mixer on high, add the sugar a scant tablespoon at a time, letting it trickle in slowly, beating until very stiff and glossy. Place half of the meringue in a clean bowl, leaving the remaining half in the mixing bowl. Place the orange extract and orange food coloring (if using) into the mixing bowl and whisk on high until fully incorporated. Carefully transfer the plain meringue to a pastry bag fitted with a large star tip, working the meringue into the bag so it fills up only one side (you don’t have to be perfect). Spoon the orange meringue into the other side of the pastry bag. On the prepared pans, pipe the meringue into rosettes, starting in the center and carefully spiraling out until you’ve created a 6-cm rosette. Bake for 2 hours, or until the exterior is crisp and sounds hollow when you tap the underside. 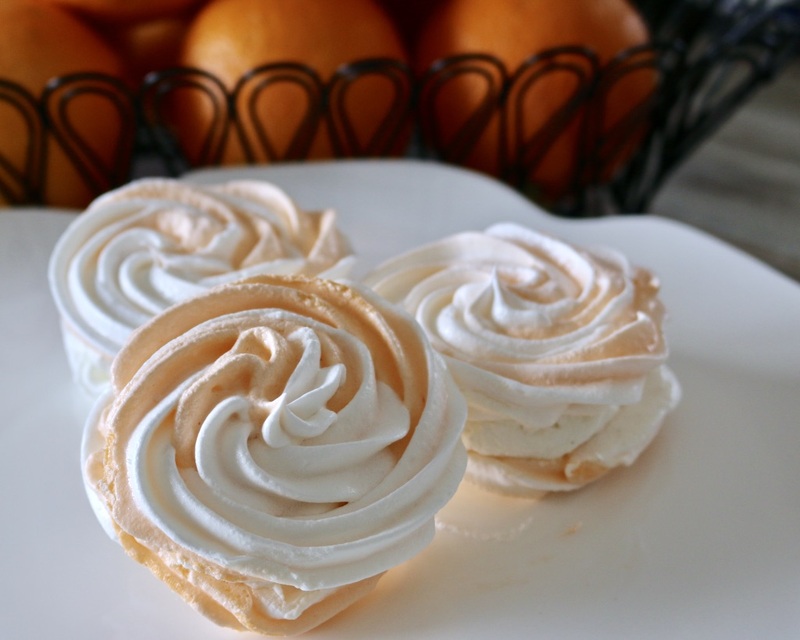 The meringues can be stored in an airtight, moisture-free container for up to 2 weeks. Add cream and vanilla bean paste to a bowl. Whip until soft peaks form. Pipe a silver dollar–sized dollop of the filling onto the flat side of a meringue rosette and sandwich with a second meringue. Serve the assembled meringue tarts immediately. Meringue Cookies are light, airy and sweet treats. They can be soft and chewy with a crisp exterior, or crisp throughout. They are sometimes known as “Forgotten Cookies” because they are cooked for a long time in the oven, but we can guarantee you that none of these cookies will be forgotten! Love your replacement of more meringue with cream, Felice. All meringue would have been way too sweet. How pretty they are with the swirls of orange! These are so pretty! 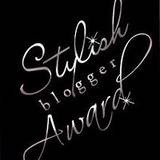 Love the orange swirled into the white! Creamsicle is one of my favorite flavors too.